Don’t Take It Personal…or Please Do. When I receive contributor’s copies of a book that I’m in, I have a go to reader that I immediately give one to. My reason isn’t only because she enjoys reading erotica, but because I know that at some point we’ll have an interesting and lively exchange aobut my story. 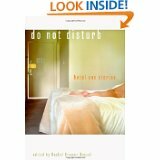 Two stories I’ve written in particular repeatedly come up in our conversations: An Honest Woman, featured in Do Not Disturb edited by Rachel Kramer Bussel and Waiting, featured in Iridescence edited by Jolie du Pre. In the first, she always questions me about my character Ruth’s decision not to settle down, but to instead carry on her routine of meeting men at the local truck stop and sleeping with them at the local motel. But in the latter story, my favorite reader wanted to know why Lucinda treated Gabriela the way she did when they seemingly had such a strong connection. These were questions I wasn’t prepared to answer because to me the dilemmas were in place simply for story’s sake. I wasn’t thinking about any particular character’s happiness; I just wanted a realistic, unpredictable and hopefully satisfying ending for the reader. That was the first time, though, that it occurred to me that someone might feel something for these characters I had created, and was maybe even rooting for them, and if so, in that, had I already acheived my goal? ← She Gets It From Her Mama?